Financial high-flyer, Simon Palmer, is being blackmailed. High finance and underhand dealings carry him into the secret world of Grettir Ásmundarson, an ancient Norseman and tröll living in London. Grettir is fighting a vicious feud with a gang of twelve Vikings. Both sides race to recover an artefact in order to escape its curse. Grettir murders one of the Vikings on a late night train in the City and Simon gets inadvertently caught up in the action. The story is based on a Norse saga, retold as a fast-paced historical thriller. The action ranges across the centuries from Viking Sweden to the battlefields of Byzantium and Circassia, with violent showdowns in Moscow and the Philippines. Grettir uses his long experience of mankind to try to understand the dark side of his soul. As an unruly individual he struggles to come to terms with himself and the world. He tries to resolve these conflicts, and the hatred of the feud, with tragic consequences. 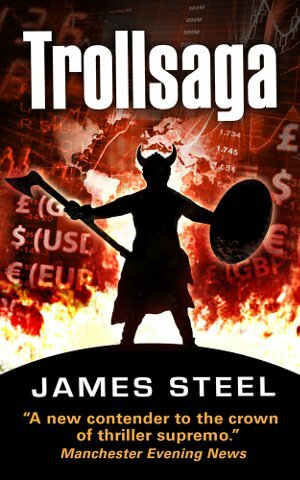 James Steel’s books have been selected for Waterstones Paperbacks of the Year and the Tesco Chart. James has spoken at the Hay Literary Festival and teaches creative writing at Oxford University.